Red wolf. The best photo of one. They may not be a species like was hoped, but they are still beautiful animals. I’ve moved on from domestic dogs. I’ve been searching for a topic for this blog for some time now, because I’m utterly disillusioned with the world of domestic dogs. I entered into that world in pursuit of the ghosts of dogs long past. I let them live a while here, but I never found them in their true essence again. I will always love dogs, and at some point, I may write about them again. But the world of domestic dogs is complex. It is firmly tied to the world of people, and people are complex. Dog people allow themselves to project their egos through the dogs to the point where it becomes really hard to have frank and honest discussions about anything. So I’ve turned to the dogs that have not created a niche for themselves by attaching themselves to our culture. Some, like coyotes and red foxes, readily scavenge from the excesses of our civilization, but they are not part of human kind. Different cultures may have worshiped the wild dogs, as we do in our own sort of New Agey, ecological worldview. But they remain distinct from us. They get to roam without leashes or collars. They don’t follow commands or guard anything but their own territories. They hunt to feed themselves. And they usually avoid direct observation by our kind. They are dogs without licenses, except “license’ to be themselves, living out the lives for which eons of evolution have molded them. They choose their own mates. They roll in the stinkiest dung. The only masters they know are forces of nature. And those masters can be incredibly cruel. They die of starvation, of distemper or rabies, of mange, and of jaws of other predators, including the jaws of their own kind. And they continue to be. Dogs without masters are an affront to all that is holy. And in their existence is true subversion. So at this stage, I side with the rebel and the renegades and not the docile sagacity of the domestics. They may yet return, but right now, I’m beguiled by the brush wolf in the gray March woods. And it is upon his trail that I shall follow now. One of the great enigmas in the world of canid zoology is the case of Hagenbeck’s wolf. Hagenbeck’s wolf is a proposed species based upon one pelt. The pelt came from an animal dealer in Argentina, who sold it to Lorenz Hagenbeck in 1926. Hagenbeck claimed there were four such skins, but he purchased only one. The dealer claimed they came from a wild dog that lived in Andes. It was sent to Germany and wound up in the museums of Munich. In 1940, a zoologist named Ingo Krumbiegel examined the pelt. The pelt’s color was black and fur was much longer than other canids from the region. He assumed that it belonged to a undescribed montane species of maned wolf. Krumbiegel ignored the pelt until 1947, when it began looking at again. In that year, he learned from Lorenz Hagenbeck that there were three other pelts just like it. That got Krumbiegel thinking. He had received from the Andes. He had thought the skull belonged to a maned wolf, but it was much larger than any maned wolf he’d ever examined or read about. Krumbiegel began to reconstruct the animal from the skin. The “mane” on the neck of the pelt was 8 inches long. He noticed the legs were a lot shorter than the typical maned wolf, which is creature of open woodland and grassland habitats and uses its long legs to help it see, hear, and smell over the tall grass. He drew sketches of what he imagined this montane maned wolf looked like. That proposed name has been the one that has been floating around cryptozoology circles ever since. Bernard Heuvelmans, the dean of cryptozoologists, thought that if Hagenbeck’s wolf really was that similar to the maned wolf, then it might be more properly classified as part of Chrysocyon. The big maned wolf skull was lost during the war, so Krumbiegel was unable to make additional measurements of it. In 2000, there was an attempt to do a DNA test on the pelt, but the researchers were unable to get uncontaminated DNA from it. The pelt had been chemically treated, making recovery of DNA from it quite difficult. But they were actually feral. It has been suggested that the large skull that Krumbiegel examined belonged to a German shepherd and that he extrapolated all of this analysis off a skull belonging to a domestic dog. I’m a bit skeptical of that suggestion. Krumbiegel lived in Nazi Germany, where German shepherds were celebrated dogs and heavily studied. He surely would have known the difference between a German shepherd or wolf skull and that belonging to a South American wild dog. No one has tried to extract DNA from the anomalous pelt since 2000. It’s generally been ignored. We do have better techniques for DNA extraction now, so maybe it is worth another go. Maybe this animal really is a montane maned wolf or some other undescribed canid. Maned wolves do rarely come in black on occasion, and this could be suggestive of a relationship. Perhaps it was a descendant of the improperly classified Canis gezi. Maybe it was a closer relative of the extinct Falkland Islands wolf than the maned wolf, which is currently listed as its closest relative. The truth is we really don’t know, but if we were to find out that it was something that spectacular, the question ultimately would be whether this animal still exists. Maybe it was among the last of its species. Or maybe it was just a feral dog. And in the grand scheme of things, it’s not that much of a priority. But wouldn’t you like to know? Within Canis, there are lots of bogus species proposed. A few years back, a team of researchers in Australia made some skull measurements of dingoes and decided that we should declare the dingo a new species distinct from the domestic dog and wolf. Never mind that every single genetic study on dingoes clearly puts them within the East Asian dog clade. A dingo is a feral dog very closely related to things like chow chows and akita inu. Comparative morphology once declared the Japanese chin a distinct species, complete with their own genus, Dysodes. Never that such a thing wouldn’t pass the smell test now, it is still being tried on dingoes. Within the genus Canis, there has always been a desire for some to split up species. Morphological variation is really great in the more wide-ranging species, but thus far, every proposed new species has come out lacking. Molecular techniques have discovered one species in this genus, the golden wolf of Africa, and there might be a distinct species of wolf in the Himalayas. And, I would argue, so has the coyote. Because coyotes split from wolves only very recently, I think a case can be made to classify them as Canis lupus latrans. But that’s not where some people want to go. In fact, as of March this year, there was a paper that came out calling for classifying the Eastern coyote as Canis oriens. I think this is quite unwise. For one thing, this ecomorph of coyote, which does have both wolf and domestic dog ancestry, is pretty new. Further, there is no evidence that this population is fully reproductively isolated from dogs, wolves, or the original Western coyote population. There might not be a lot of crossbreeding with domestic dogs. But Western coyotes that are free of dog or wolf blood can still come into the East.There are no massive barriers that stop these coyotes mating with coyotes that might have wolf or dog in them. Roland Kays, who was part of one of the original genome-wide studies of North American wolves, recently wrote a piece arguing against calling the Eastern coyote “a coywolf” or a distinct species. In the piece, Kays argues that this population of coyotes is not reproductively isolated, so it really is premature to call them a species now. I would argue that the Eastern coyote is actually an ecomorph that is evolving to live in the human-dominated world that was once woodlands of Eastern North America, and an ecomorph is not a species. It could become one, but it takes quite a bit of time and isolation in order to do so. In fact, I think the big take away from all the most recent study is that coyotes are a small type of wolf. And that means that all this splitting we’ve done in Canis isn’t really all that helpful in understanding their exact biology and natural history. That doesn’t mean there aren’t species of wild dog to be discovered. The case to split red foxes into two species is quite strong, and there is also a strong possibility that the gray foxes of the West and of the East are distinct species. The new species of wild dog will be found in creatures in like these, not in the larger dog species. But Canis is where the charismatic dogs are. Wolves and their kin capture our imaginations. They are the closest relatives of the domestic dogs, and the domestic dog is descended from the Old World wolf. Within domestic dogs, we’ve been splitting them up into different varieties for thousands of years, and in the last two hundred, we’ve been doing so almost insanely. This has had to have had some effect, perhaps subconsciously, on how we view their closest relatives. At one time, people used to go nuts naming things. Clinton Hart Merriam named dozens of species of bear in North America, which we now all recognize as belonging to one species. There is a herpetologist in Australia who does much the same thing with snakes and lizards in that country. We live in a time when most of the larger fauna have become known to science. Pretty much the only way new species can be discovered is through trying to race molecular evolution. We don’t live in those times of gentlemen naturalists taking ships up the Congo River in search of new species of leopard. We’ve just cataloged so much nature since that time. We don’t know it all, but we know a lot more than we did in 1880 or 1920. And while I’d argue that the term “species” has to have a subjective element to it, it can’t be so subjective that it become squishy and useless. And that’s unfortunately what we’re getting with things like Canis dingo and Canis oriens. They really aren’t that much better than Dysodes pravus. In the US and Canada, there has been much discussion about how coyotes have been able to colonize so much territory. They were pretty much a Western species that was able to colonize land that had been previously occupied by wolves. We killed the wolves off and did the same with coyotes. The wolves became exceedingly rare and extirpated from much of their range. The coyote’s range expanded. We know this well. It’s one of those wildlife stories that North Americans know well. The fact that they are found in new areas mean that it’s actually quite common for people to call them an invasive species, which is a bit erroneous. Coyote-like animals have been living North America for millions years, and this current form, which is perhaps more closely related to wolves than the previous models, is something our ecosystems have been putting up with for quite some time. Coyotes or coyote-like animals lived in the East all through the Pleistocene. the current form isn’t invasive but reclaiming lost territory. The thing about coyotes, though, is they are expanding their range to the south as well. Most of us are aware that coyotes live in Mexico. The term coyote is derived from the Nahuatl coyotl, which supposedly means “barking dog,” and their range expanded to the south as well. The tropical forms of coyote were probably always present in southern Mexico and northern Central America, but today they are found to the eastern part of the Panama Isthmus. This eastern part is the part that attaches to South America, and should coyotes continue to expand their range in Panama, they will probably cross into Colombia. These southern coyotes are expanding along the Pan-American Highway and the expansion of cattle ranching in the region. The current thinking is they may not make it South America until and unless the highway is built across the province of Darien into Colombia, which has generally been put off as unfeasible. I don’t know if I would put much stock into the road being the only way that coyotes get into South America, because as coyotes began this expansion south, another species of canid began its expansion north out of South America. The crab-eating fox is quite common in northern South America, and it started showing up in Panama in the 1990s. This animal is experiencing a range expansion in Colombia, using open areas around the Pan-American Highway as its habitat, just like the coyote in Panama. One recently was captured on trail camera near the Panama Canal. That means that crab-eating foxes were able to cross the relative wilderness of Darien to get deeper in Panama. It also means that coyotes could quite possibly cross Darien into Colombia, just as the crab-eating fox went the other way. Much stock has been placed on the fact that coyotes prefer open habitats, but I wonder if this is missing something else that could have led this territory opening up for coyotes. Central American jaguar and cougar populations are on the decline. With the larger predators becoming rarer, smaller ones can begin to fill in, just as coyotes did when wolves were wiped out of most of the Lower 48. Coyotes in my part of the world make use of forested habitat quite extensively. It is very rare to see one out in the open during the day, but you can see them out and about in the woods during the day. Granted, I’m talking about temperate deciduous forest, and that which exists in Panama is tropical forest. But I’d be very surprised if coyotes didn’t use the habitat. So if the crab-eating fox is able to work its way into the North American continent a little deeper, why wouldn’t the coyote be able to go the other direction? Further, the crab-eatng fox isn’t the only South American wild dog to wand up into Panama. The much rarer and much more elusive short-eared dog has crossed from Colombia into Darien at least once. Unlike the other two species, it is a much more forest dependent animal, so even if it were to spread, it would only be found in forests. But the fact that something as weird and as specialized as a short-eared dog would take the baby steps pretty much would hint that something as bold as a coyote could easily take the steps in the other direction. So dogs are moving north, and dogs are moving south. And if the coyote makes it into Colombia, it will be the first creature from the wolf lineage (other than domestic dogs) to do so since dire wolf came into the continent. When the dire wolf came, it was a big, packing creature that readily hunted camelids and other ungulates. Now a meeker and more generalized offshoot of that lineage is working its way toward South America. They may not make it. But I honestly wouldn’t bet on it. They didn’t need a road to get them from Kansas to Nova Scotia, and I bet they really don’t need a road to get them from eastern Panama into Colombia. And after the hit South America, I think it’s quite time that Australia got a chance to enjoy coyotes. They will keep red fox numbers in check. What could possibly go wrong? We often talk about the South American wild dogs. The South American wild dogs are a sister group to Canis and its allies, and in South America, evolution allowed dogs to go many unusual directions. When the dog family phylogenetic tree was drawn from sequencing the genome of a boxer, I was amazed that it put the bush dog, which is sort of a wild version of the dachshund, as being a sister species to the maned wolf, which has very long legs. There was actually a big debate as to where the bush dog actually fit. When I was learning about dog evolution as a child, I had books that told me that the dhole, African wild dog, and the bush dog were all closely related because of their trenchant heel dentition. One of their carnassials has a single, blade-like cusp that increases their ability to bolt shear meat. The phylogenetic tree that was created from the dog genome sequence pretty much ended this discussion. The dhole and African wild dog were both found to be closely related to Canis, more so than the side-striped and black-backed jackals. The bush dog was with the maned wolf and the other South American canids, and the trenchant heel dentition was the result of convergent evolution. In 2012, a study was released that that was meant to update the divergence times with all extant carnivora. The researchers used large samples of DNA and other characters to determine when these animals diverged from each other. Some of these “other characters were things like vocalization and scent gland similarities. Its phylogenetic tree for Canidae is similar to that in the aforementioned paper on the domestic dog genome, except that it greatly increases the divergence time between species. For example, it has the Urocyon foxes diverging from the rest of Canidae 15-16 million years ago, instead of the 9-10 million years that the dog genome paper found. It also has the golden jackal and the coyote being sister species, and the wolf is not the closest relative of the coyote. We now know this is very much in error, and it probably comes from the non-genetic “source trees” that were used in the analysis. It has has the Tibetan fox as being related to the extinct Falkland Islands wolf, which happened because there are almost no genetic studies on the Tibetan fox. Both the Tibetan fox and the Falkland Islands wolf had kind of weird squared off bodies, though, and this type of analysis does use morphology. It has the dhole as being closely related to the wolf, golden jackal, and coyote. But it has the African wild dog splitting off much sooner from this clade, and what’s more, it has the bush dog as its sister species! 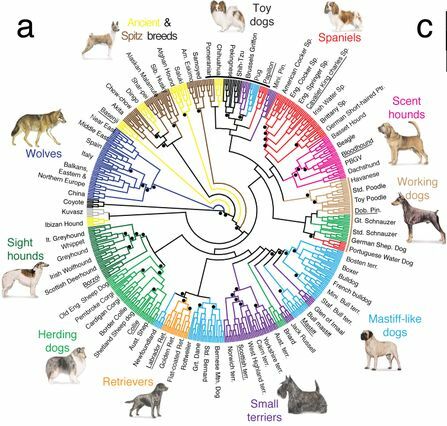 One should be skeptical of this finding, because of its use of so many non-genetic “source trees,” it is going to miss the problem that occurs so much with dog species. Convergent evolution and phenotypic plasticity run riot in the family, and it is really hard to figure out relationships between species using just morphology and behavior alone. This would make a lot of sense if it were confirmed with better genetic studies. Bush dogs are very weird animals. They are the only South American canids that hunt in packs. They really don’t have a rich fossil record, and it is pretty hard to connect them to other South American wild dogs. It is tempting that they might be something that weird, but we need more evidence. If they really did turn out not to be part of the South American clade of wild dogs and to be closer to the African wild dog, it would be a real shocker. The questions that would arise from it would be how it evolved. We have evidence of Xenocyon coming into North America. Xenocyon is traditionally thought of as the ancestor of the African wild dog and the dhole, but it may not be. But there is also evidence of dholes or dhole-like dogs that are actually closer to the AWD coming into North America and making it as far south as Mexico. So maybe there is something to it. But this sort of study does have its limits. It’s trying to morph both classical and molecular techniques for taxonomy, and those tend not to hold up very well. But I still think it’s worth examining. I’m sure that just about everyone has seen the footage of the Tibetan fox. Its blocky head is really unique among canids, and one theory about why it has such an unusual head is that the head actually makes the fox more camouflaged around rocks as it stalks its prey. The Tibetan fox is found in the Tibetan and Ladakh Plateaus, and it pretty much found only in high grasslands. It is a specialist of this environment. The mitochondrial genome of this species was sequenced recently. Preliminary studies had indicated that its closest relative is the corsac fox, which ranges in the steppe country that runs from the eastern edge of the Caucasus to northeastern China. It lives in arid, semi-arid, and grassland habitats to the north of the core range of the Tibetan fox. The corsac is the basic fox. It is smaller than most red foxes, and it comes in gray or reddish brown. And to be completely honest with you, I have a very hard time telling corsac foxes from North American swift foxes (Vulpes velox). I should note that even though the two look alike, the corsac is more closely related to the red fox, while the swift fox* is very close to the arctic fox (Vulpes lagogpus). Both swift and corsac foxes are adapted to grassland ecosystems, so their similarities can be chalked up to simple convergent evolution. The researchers who sequenced the Tibetan fox mitochondrial genome also looked at other dog species and found that modern dog species radiated very rapidly. The authors estimate less than 5 million years separates Canis species from the maned wolf, which is actually quite about half the time that has been estimated for the divergence between Canis and its allies and the South American wild dogs through the sequencing of the dog genome. Mitochondrial DNA studies can lead us astray, but this is still an interesting find. A population of corsac foxes, whose range had been pushed south during the Pleistocene, were able to roam into the Tibetan Plateau during a warming period. They were then cut off by glaciers and began their journey toward speciation, adapting the high grassland habitat in ways that made them quite different from their ancestors. The squared off heads gave the foxes marginal advantages in hunting in the high, rocky grasslands. The authors didn’t find any genetic evidence of any sort of adaptations in the mitochondrial genome for higher altitude living among Tibetan foxes. Those genes probably do exist, but they don’t exist in the mitochondrial genome. So what the researchers found is that Tibetan fox is very closely related to the corsac fox. This is not a surprising find, but I have wondered where this fox really does fit in the dog family. It’s from such an isolated area that virtually no studies have been done on it. The squareness of its head makes the Tibetan fox a bit of a celebrity in the digital age. If BBC cameras hadn’t filmed it (twice! ), it wouldn’t really be known. I’d only ever heard of it from a children’s book, which included a bad painting of one. It was just a nondescript fox as far as I was concerned. So the Tibetan fox is a modification on the basic fox. It evolved from the banal to the bizarre. Bizarre enough to be on the BBC. *The study looked at kit foxes. Kit foxes are closely related to swift foxes. Both are very closely related to the arctic fox.